A gorgeous one layer Chocolate Buttermilk Cake with a tender crumb. 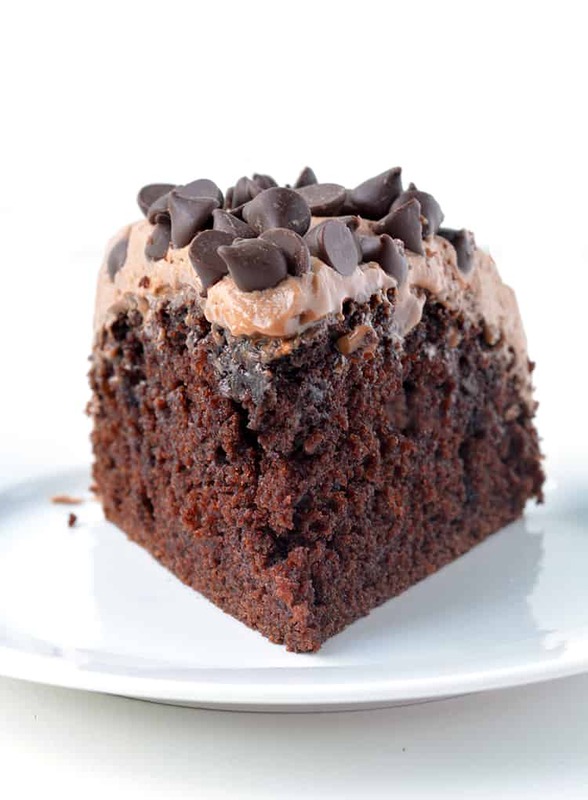 Covered in creamy real chocolate frosting and a boatload of chocolate chip, it’s THE best chocolate cake EVER. To what, you ask? To EVERYTHING. 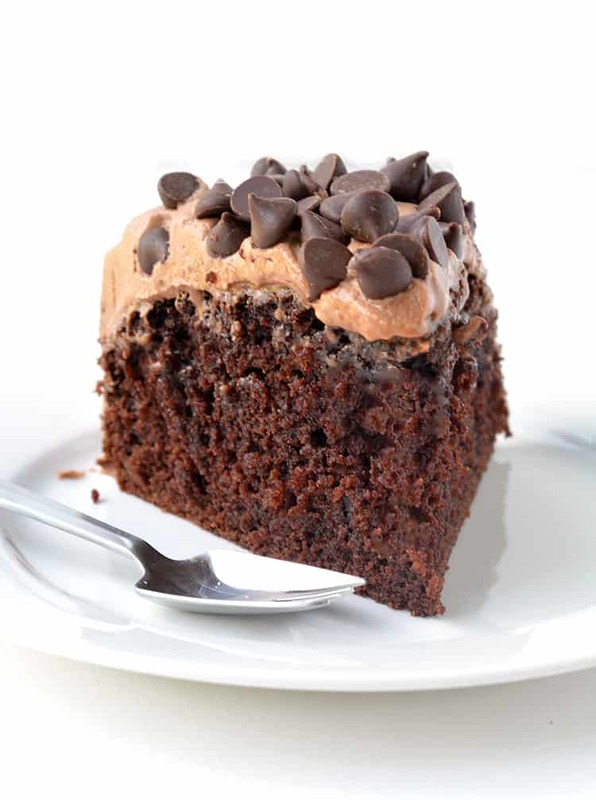 I’m talking a one bowl, face-plant-worthy, I-must-have-seconds kind of chocolate cake. If you’re looking for a go-to Chocolate Buttermilk Cake recipe, then this is your day. It took a number of tries to get this cake just right, but it was more than worth it. All I knew was that I wanted a chocolate cake that was THE chocolate cake. You know the one. The cake that everyone requests for their birthday. The cake recipe that you print out and keep in your recipe box because it’s THAT good. The cake that when served, everyone asks for seconds. And yes, this is THE cake. When I started recipe testing 👆🏻 I knew I wanted a thick one layer chocolate cake that could be made with just a bowl and spoon. My first attempt used melted butter, and while it looked great in form, it was too dense and dry. I cannot stand dry cake, so I knew we had some work to do. 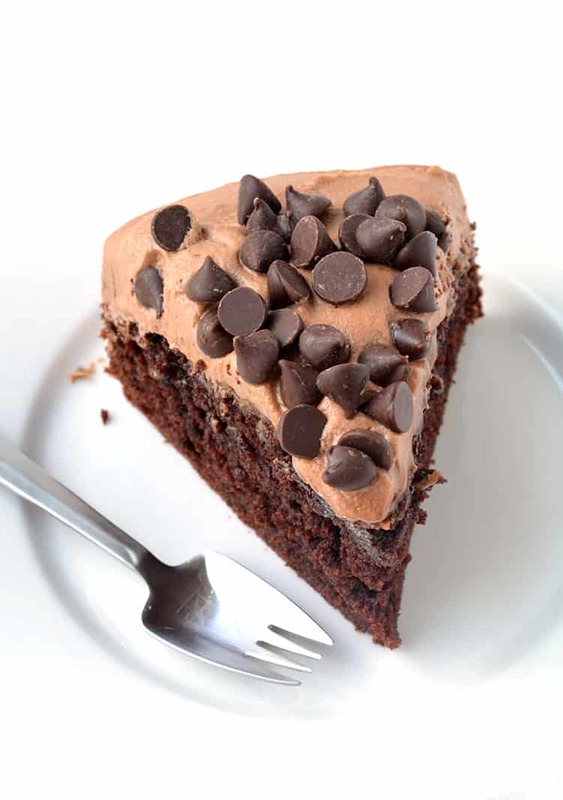 I then switched to vegetable oil as the main fat, as it tends to lend itself to moist chocolate cakes, as I know from my favourite Mint Chocolate Layer Cake. However the cake rose too much in the middle and tasted vaguely of oil – ew. However the third time round we got lucky. ❤️ Like seriously lucky. The perfect Chocolate Buttermilk Cake was born. It’s soft and tender with a rich cocoa flavour and a gorgeous texture. 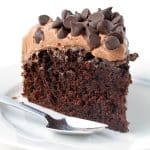 I went back to melted butter, but this time added a little more sugar, a little less buttermilk and a little more water – yes hot water is the ultimate ingredient in chocolate cake. 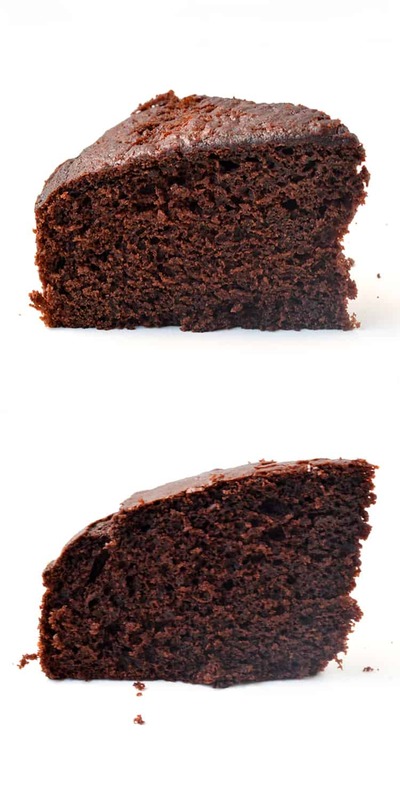 And then and there my new favourite chocolate cake was born. 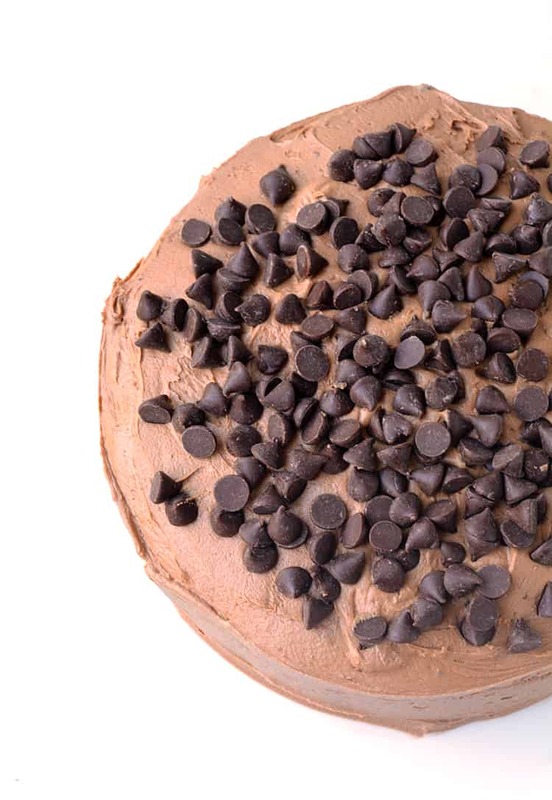 Once you take that cake and add my favourite real chocolate frosting AND a boatload of chocolate chips, you have one downright delicious treat. It’s chocolate on chocolate on chocolate. And I love it. It’s the ultimate chocolate lovers cake. And the fact that it can be made with a bowl and spoon, just makes it all the more tempting. There’s no exotic flavours. No outrageous ingredients. Just an old-fashioned, lick-the-bowl, chocolate cake. 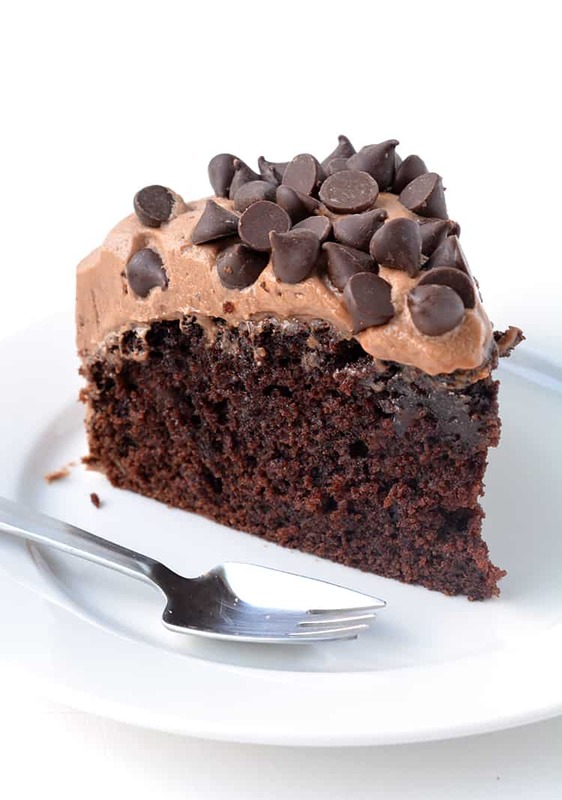 Even though the cake only uses cocoa powder for it’s chocolate flavour, it is oh-so-choco-licious. And once you add lashes of luscious chocolate frosting, you are all set. And this frosting is next level. 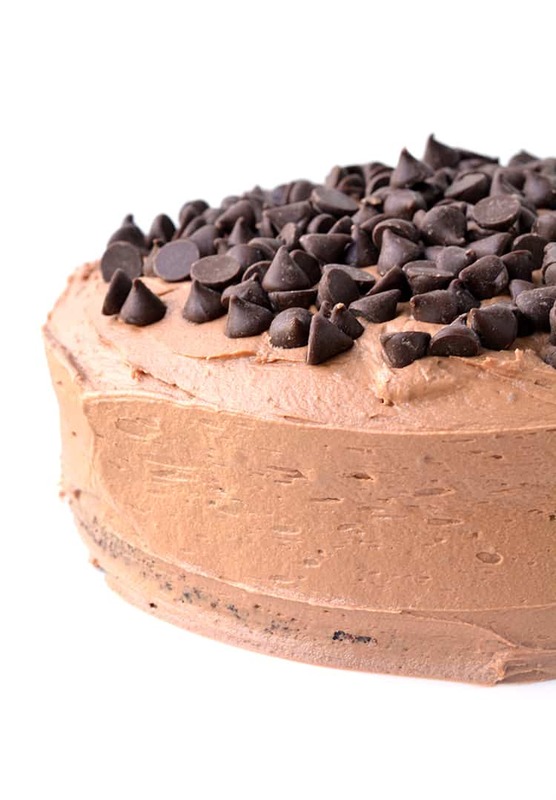 Made with melted dark chocolate, it’s a fluffy, creamy, melt-in-your-mouth kinda buttercream. Honestly, I can’t wait to make this Chocolate Buttermilk Cake again. And handy tip, if you don’t have store bought buttermilk on hand, you can make your own. Just take 1/2 cup of regular milk and add 1 teaspoon of white vinegar. Voila! Homemade buttermilk. I really hope you enjoy this lovely chocolate cake. If you do make it, be sure to take a photo and share it with me on Instagram. A gorgeous one layer chocolate buttermilk cake with real chocolate frosting. Preheat oven to 180 C (360 F). Grease and line an 8 inch round cake tin with baking or parchment paper. In a large mixing bowl, add flour, cocoa powder, sugars, baking powder and baking soda. Boil the kettle and pour out 1/2 cup of hot water and set aside. In a separate bowl, add butter, eggs, vanilla and buttermilk and stir briefly. Add butter mixture to dry ingredients and stir to combine. Add hot water and stir until chocolate cake batter is smooth. It will be a thin batter – that’s ok.
Place in the oven for 45-50 minutes or until a skewer inserted in the middle comes out clean. Leave on a wire rack to cool completely. Add half the sugar and one tablespoon of milk and beat until combined. Add the remaining sugar and beat until smooth. Add melted chocolate, ensuring the chocolate is still smooth and melted but is not warm. Beat until the chocolate is completely mixed through. If frosting is too thick, add an extra tablespoon of milk. Generously frost the top and sides of the cake using a spatula. Sprinkle over chocolate chips. *Make your own buttermilk by adding 1 teaspoon white vinegar to 1/2 cup milk. *If your frosting is too thick, add an extra tablespoon or two of milk and beat until smooth. I followed the recipe and baked the cake in an 8 inch cake tin…I took it out of the oven after 50 minutes when the skewer I inserted came out clean, but after I cut the cake the inside was very under-cooked. Would could be the problem? Hi Tina, the skewer test should work, if you insert it right into the middle of the deepest part of the cake. Look for other clues too, like if the cake springs back to the touch or starts to pull away from the sides of the pan. Every oven is different. I recommend everyone get an oven thermometer to accurately see what temp your oven is. I hope that helps a little. I followed the recipe and I think the cake turned out really well. Instead of making it in a 8 inch pan, I actually made it in two a 2-tier 7-inch and 4-inch springform pan. It came out nicely and was very cute. I think my only issue was that I tried following the frosting recipe and it didn’t really come out as well. The flavoring was good, but it just didn’t seem to want to stick to the cake and it didn’t really go on the cake too well, so I wasn’t sure where I messed up because the frosting might’ve been too thick? Hi Maggie! So pleased you enjoyed this cake – a two tiered cake sounds lovely. If your frosting was too thick, next time add a little bit more milk to help loosen it up. It should be nice and creamy, and easy to spread. 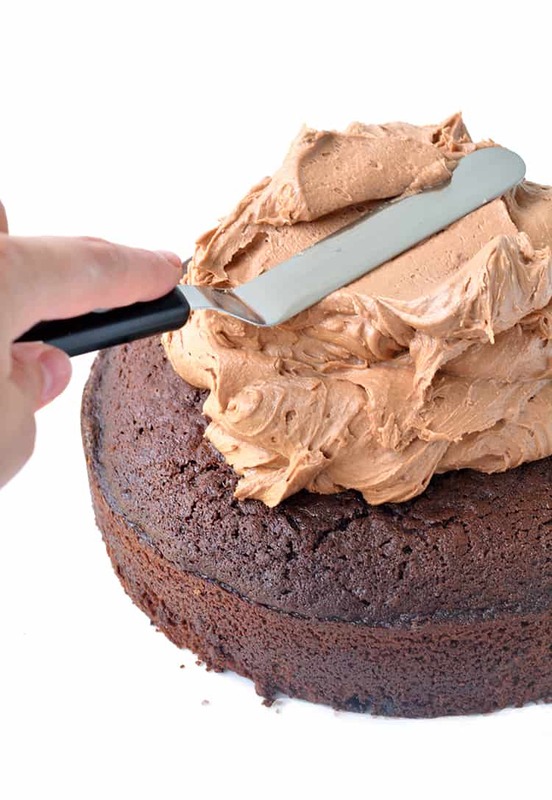 It can thicken over time, so it’s best to frost the cake as soon as you make the frosting too. I hope that helps! Could I leave out the cocoa powder so it is a vanilla cake? Hi — Just a note about using coffee when baking with chocolate, The coffee flavor does not come through or dominate, rather it is used to accentuate or deepen the taste of chocolate. I have not yet made this cake, but when I do I will replace the hot water with coffee. And, add a pinch of salt as well. Have you tried hot coffee in place of hot water? Ccurious what it would taste like. I’m going to make it today and I love coffee but husband hates it. Amazing recipe! This cake is easy and SO DELICIOUS! Don’t know what went wrong but my cake was dry. How can I fix that? Hi Alice, sorry to hear that! Did you use any substitutions or change the method in any way? It should produce quite a moist cake. My suggestions: make sure you measure all your ingredients in grams to ensure you don’t add to much flour, and don’t over bake your cake – that’ll also result in a dry cake no matter what recipe you use. I followed the cake recipe to a T, but put it in a cake pan with the hole in the middle. My cake was dry too. It looked beautiful and I was really excited to try it out…but disappointed in the dry texture. Hi Patsy! I’m very sorry to hear this. It should be a lovely moist cake thanks to the buttermilk. 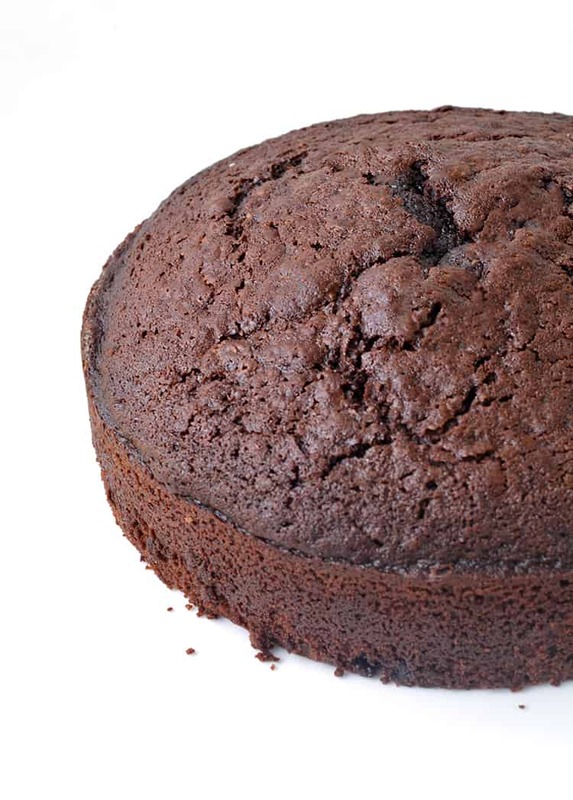 If you used a Bundt pan, your cake may have cooked faster than the time specified. If you over cook cake it tends to dry out. Otherwise, it might be a case of adding too much flour or over mixing the batter. HI, great cake, I decided either use cup quantities or gms they are a bit different, but slightly bigger cake with gms,. Lovely flavor and texture. Needed less cooking for me but mine always do for some reason. I always use ganache icing, basically equal quantities 70% chocolate and cream, the best!! This cake is now my go to for when I have any need for chocolate cake for any reason, at home after work, feel the need for great cake? THIS is the recipe, need cake for a birthday or any other occasion? THIS is the recipe! Cooked beautifully, so easy to make, and the texture is perfect, not to dense, moist and delicious …..omg! This cake looks amazing! Would it be possible to omit the baking powder and baking soda and instead whip up the egg whites for the rise? Would the recipe still work? I have to say thank you!!! I baked this cake for my husband’s bday. So easy to make and delicious!!! Regards from Venezuela. Can I stack this cake and fondant cover it please? Have tried once as a birthday cake for chocolate lover and it was superb! Very delicious. Althoug I put a different frosting – mascarpone + cocoa powder + sugar. Thanks for this recipe! I made this and the cake was great but my frosting was a disaster. I followed the recipe exactly and added both tablespoons of milk but it was really thick, like a paste, and was tearing the top of the cake as I tried to spread it. I haven’t made buttercream frosting before, so maybe I didn’t beat it for long enough or maybe it needed more liquid than the recipe called for? We did like the dark chocolate flavor, though! Made this today. Best chocolate cake I’ve ever had! This cake was delicious! Thanks for the recipe! Oh so pleased you enjoyed it Myra! 😊 Thank you for lovely feedback. How can 1/2 cup of brown sugar weigh 45 grams, does the recipe take 45 grams or 1/2 cup which weighs about 110 grams? WOW this cake is just stunning! Looks so moist and chocolatey! YUM! This was delicious! It will be my go-to chocolate from now on. Love that Josh! Thanks for the lovely feedback.